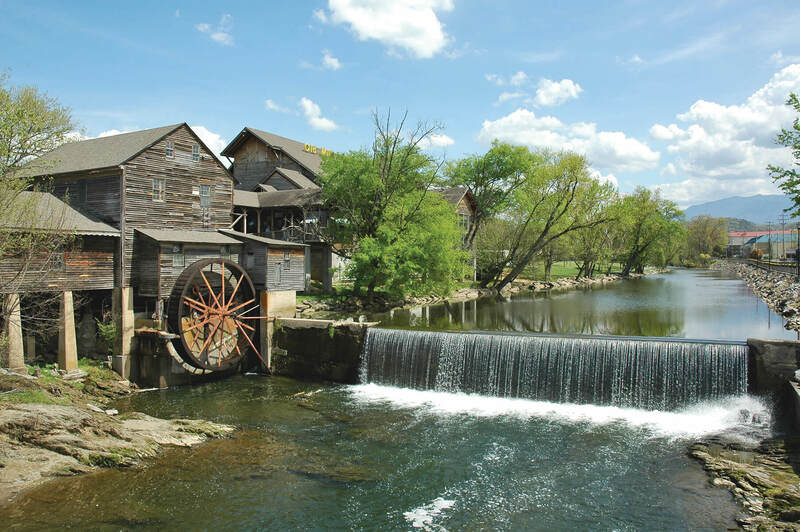 This wonderful Old Mill two bedroom cottage “Believe ‘N’ Dreams” is conveniently located less than one mile from downtown Pigeon Forge. Tastefully decorated with a modern charm, the cottage features a full kitchen, living room with a stacked stone gas fireplace and two full bedrooms. This cottage has an attached garage making it perfect for the car or motorcycle enthusiast. Just a minutes walk to the pool and hot tub located within the resort. Don’t feel like fighting traffic? Just walk a couple blocks to the trolley stop and downtown Pigeon Forge. A covered front porch makes the evening melt away after a long day exploring this beautiful area. The decor was beautiful in the cottage. The bed was comfortable, couch and love seat was also comfortable. It’s in a great location. This was our second stay and will not be our last one. Recommend it for couples or families. After staying in this condo last year, my husband, grandson and I chose to stay here again last week. We love everything about it–the cleanliness, the closeness to the things we like to do, the pool and the neighborhood. When time to pack the car to leave yesterday it was raining so being able to do it in the garage was a great benefit. The lady in the office and the property manager could not be any nicer. When we arrived on the Sunday before memorial day the tv in the master bedroom did not work. Kelly came Tues. with new tvs for both bedrooms and had them up and running in a short amount of time. Thank you Kelly. If we ever travel to this area again we will stay in this condo, if available. Thank you everyone for a great stay. This place was very clean and super close to all the attractions! Very easy to find as well. It was a very welcoming space and felt like home! The kids loved the open floor plan and the huge closets, to hide in lol! We will def be back! The property was just as described. Everything was great, plenty of room and close to all activities. Definitely stay there again. Loved it! This was one of the nicest places we have stayed. I loved that it was close to town. No narrow winding roads to a cabin where you couldn’t get turned around. Loads of room, very comfortable, very clean. There was only my husband and I, but we have discussed how nice it would be to have family or friends with us. We will definately be staying here again! Our stay at the condo was great and we really enjoyed it. It was a lot better than staying at a hotel, it was very quiet and clean. It was convenient to everyplace that we wanted to visit. We hope to stay there again in the near future. Thanks for the excellent service we received from you. Can not say enough about how much we enjoyed this condo, spent eight nights and hated to leave, will be our spot for our next trip to Pigeon Forge. We had a wonderful time on our vacation, and the facility was wonderful. It was off the beaten path, close to the main strip in Pigeon Forge, but not right in the middle of everything. Once we found the back roads, we were only 10 minutes to the theme parks. The condo was wonderful, very nicely decorated, and much bigger than we’d anticipated. We were all very happy and would love to return!